As an avid hiker, I look to get off trail sometimes and bushwhack my way cross-country. The path is often harder, but I am usually rewarded with great views that others don’t often see. That idea of getting off the beaten path and going a non-traditional route to find a better alternative can also work with regard to small business loans. Now it may sound funny to hear a banker say it, but today there are more ways to obtain capital to start or improve a business than through a traditional bank loan. Hopefully, your bank and your banker can be the ones to help you find that path, even if it’s not directly through them. That is why some banks are making a real conscious choice to become strong partners with the U.S. Small Business Administration (SBA), as well as other non-traditional lenders. Many readers may think about the SBA as a U.S. government agency that provides support to entrepreneurs and small businesses - but with the reputation of being bureaucratic and unwieldy. I used to work at the SBA and I’m here to tell you that the organization has actually revamped many programs to help simplify the loan environment and reduce the paperwork down to just one SBA form to apply for a loan (in addition to normal bank application forms). In fact, the SBA has consciously infused its process with creativity and flexibility in its lending standards to give banks the ability to best structure a lending solution for small businesses. Underpinning that access is the SBA’s express line of credit, which targets loans as small as $5,000 and provides for extremely quick underwriting and an overall streamlined and efficient process. Further, some banks today are working very hard to become connectors in the non-traditional loan space. They are building relationships with alternative lenders so that businesses which may not qualify for a traditional bank SBA loan, have another avenue to pursue. Microlenders, 504 Certified Development Companies (CDC’s) and mission-based Community Development Financial Institutions (CDFI’s), as well as other resources can offer more loan solutions to small businesses now than ever before. 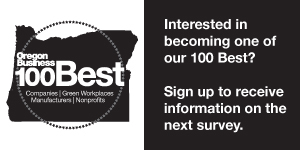 Nonprofits in Oregon, such as Business Impact NW, Mercy Corps NW, Micro Enterprise Services of Oregon and Oregon Association of Minority Entrepreneurs are other options as well. With the economy doing well – especially in Oregon’s small business space – and with more dollars available, these sorts of non-traditional lenders have sprung up in order to accommodate that growth. Your banker (if they are plugged into this non-traditional loan ecosystem) can connect you to similar entities and help you navigate the process toward accessing the capital you need. I believe that a “warm hand off” from banker to a non-traditional lender is always in the client’s best interest. Further, many times small businesses are just not aware of these alternative lenders. For banks, even if they aren’t going to book a loan by advising a client to go this route, they can work to establish other relationships such as deposits and other activities that assist their client today. And if that first non-traditional loan helps the client grow and thrive, the relationship will continue to grow and thrive between owner and bank. Finally, the non-traditional loan path is also a great place to really assess if a business is even ready to be seeking a loan. Let’s face it, some entrepreneurs are so eager to begin their journey that they haven’t thought everything through and aren’t yet ready to actually launch. In this “not ready” situation, a banker/partner can refer clients to the SBA’s resource partners – such as SCORE (formerly called Service Core of Retired Executives) and the SBDC (Small Business Development Center Network) – to get free business advising. Many times the business doesn’t have things in order and they need to get some guidance with their business plan, projections and a host of other important criteria. These two organizations provide that guidance and more, and some banks are partnering with them to help add value to client relationships. In today’s business environment there are many trails that can a lead a small business owner or entrepreneur toward obtaining the capital they need to succeed. Of course, banks are there to fulfill this need, but more and more, the strategic alliance between a banker, the SBA and the newer non-traditional loan organizations are expanding options. Sometimes, getting off the beaten path may be just the direction you need to go in order to reach your destination of success. Scott Bossom is senior vice president and SBA loan lead from Columbia Bank.